Cozy accommodation awaits you at the end of every stage, as perfect as the gentle landscape, climate and hospitality. At the entrance to the mysterious valley of Aldudes, the Iparla ridges are the kingdom of the vultures, hovering majestically over St Etienne de Baigorry, and not far away, Saint Jean Pied de Port. On the flanks of the Artzamendi, formerly surveyed by smugglers, it is sometimes hard to know if you are in the mountains or in the countryside, in France or in Spain ... peaceful and pastoral places where it is good to stroll without haste. 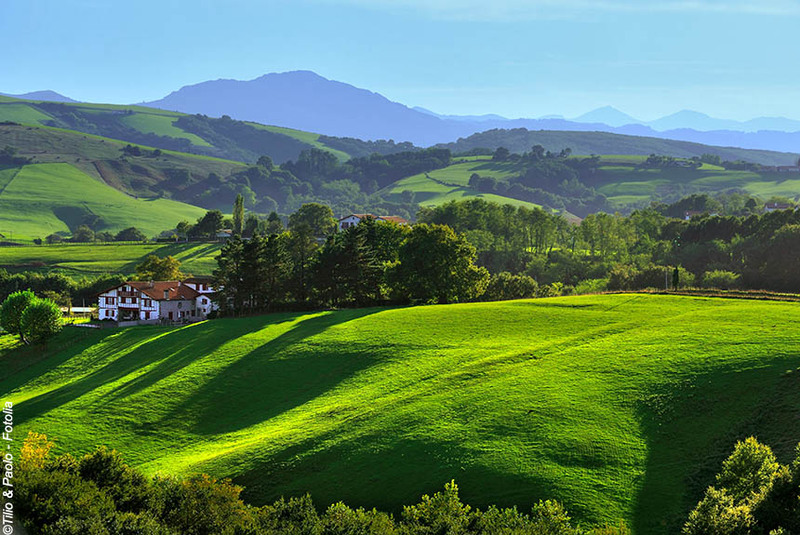 However the eagerness to discover the beautiful red and white villages of Itxassou, Espelette, Sare and Ascain will carry you onward; the Basque "frontons" and the local products which are numerous here, and carefully cooked to treat the taste buds. Finally, the Rhune, reining over the Atlantic, takes you to the coast. From 15 April to 31 October. Day 1 – St Jean Pied de Port - Col d’Ispeguy – Bidarray (4.30 or 6.30 hours walk) +550m or+800m /-900m or -1300m. Day 2 - Bidarray – Itxassou (4.45 hours walk) +590m /-650m. From Bidarray, the mythical smugglers trails crisscross the pastoral flanks to the summit of l'Artzamendi, descent by the Pas de Roland to the village of Itxassou, famous for its cherries. From Itxassou, climb of the Mondarrain, fantastic views over the green landscape, descent to the typical village of Espelette, decorated with red garlands of chillies. From Espelette to Sare with its pretty courtyard, passing through countryside and villages, across the hills overlooking Nivelle and Ainhoa; the Rhune is not far away! Day 5 - Ainhoa – Ascain (3 to 5.45 hours walk) +160m to +880m /-500m to -840m. 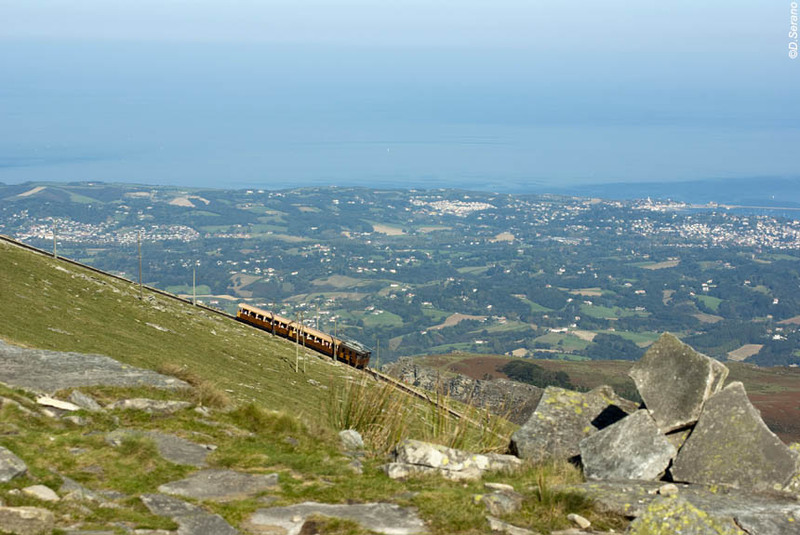 Climb of the Rhune - or by train if you wish ... - 360 ° view: ocean, heaths, mountains as far as the Hautes-Pyrenees and the Spanish Basque Country. Descent to Ascain. 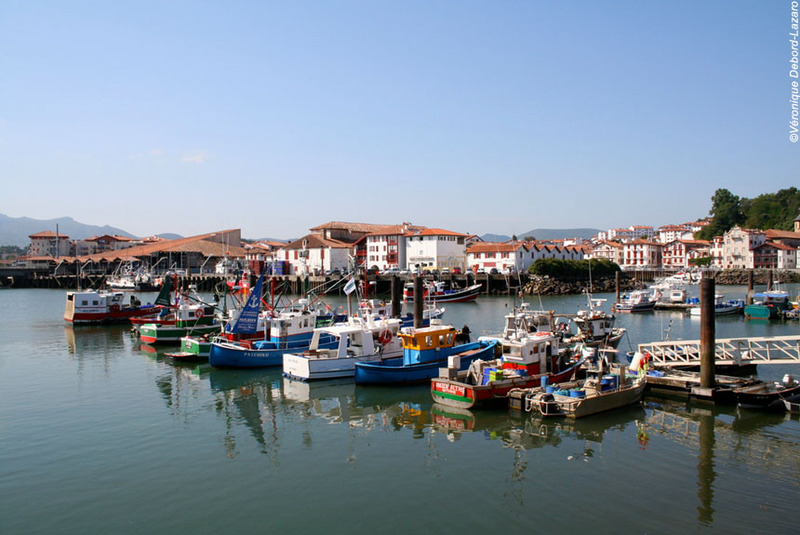 Short transfer to Saint Jean de Luz or the optional Kayak at the Nivelle to the port of Saint Jean de Luz and to Socoa. 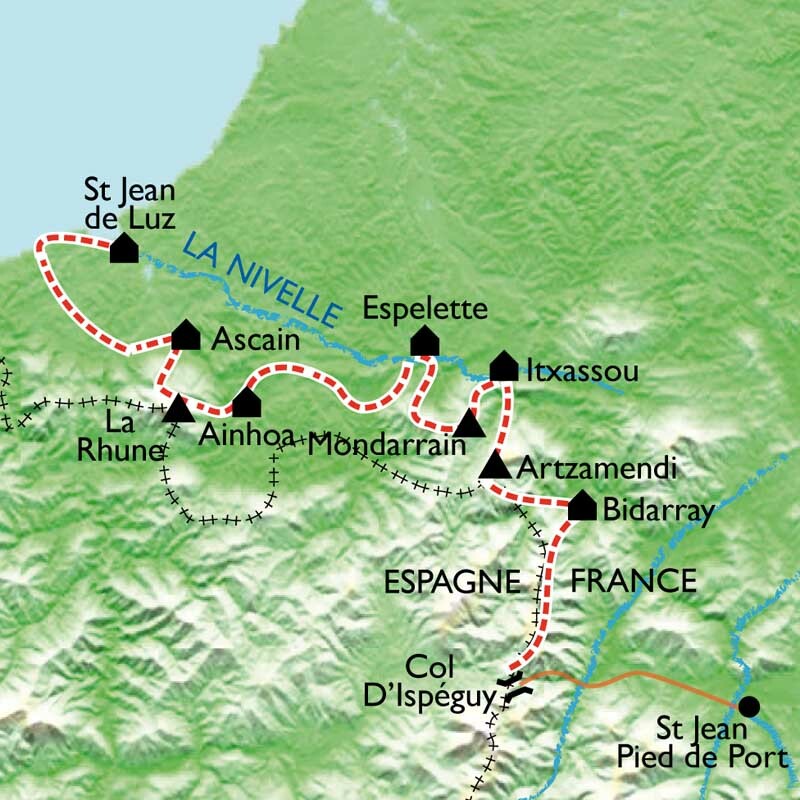 Loop at the foothills of Urrugne with meadows and heaths and return to St Jean de Luz along the coast passing by Socoa and Ciboure. End of stay after breakfast. - 6 nights accommodation (3 nights in a hotel **, 3 nights in a hotel ***).